The three U.S. astronauts currently aboard the space station, as seen in August 2018. You may have traveled for Labor Day weekend, but you can't top the holiday excursion being shared by the U.S. astronauts who marked the holiday in space. Three Americans are currently living on board the International Space Station: Cmdr. Andrew Feustel, Ricky Arnold and Serena Auñón-Chancellor. The trio had the holiday to themselves just a few days after the astronauts were forced to ignore their scheduled tasks by a small leak that was detected late on Aug. 29 in a Soyuz capsule attached to the space station. That leak was fixed the next day, and the patch held overnight, according to a NASA statement released on Aug. 31, allowing crewmembers to return to their normal duties. 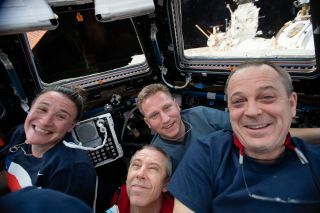 The astronauts are free to spend their day off however they choose, NASA spokesperson Dan Huot told Space.com in an email. "As usual with holidays, it is free time, so what they'll be doing is entirely crew discretion (so we don't have insight in advance. )," he wrote in an email. September will be busy for Feustel and Arnold, both of whom are preparing to conduct a spacewalk later in the month. Today will also be their last holiday in space this visit, as they are scheduled to return to Earth in October. Auñón-Chancellor is due to remain aboard the space station until December.